My name is Paul Ruvolo, and I am the director of OCCaM lab. I am in my sixth year as a faculty member at Olin College. If any of the information below sparks your interest, please send me an e-mail. I am interested in a number of areas, including assistive and adaptive technology, interdisciplinary computing education, and machine learning. We are exploring the use of emerging mobile technologies to enable radical improvements in access for people who are blind and visually impaired. In contrast to typical approaches that develop technology first and ask questions later, in this project we are fully involving co-designers who are blind and visually impaired in all phases of the design process. The work draws on threads from many fields including design, engineering, computer science, and disability studies. An example of our work is the Clew app (shown to the left). 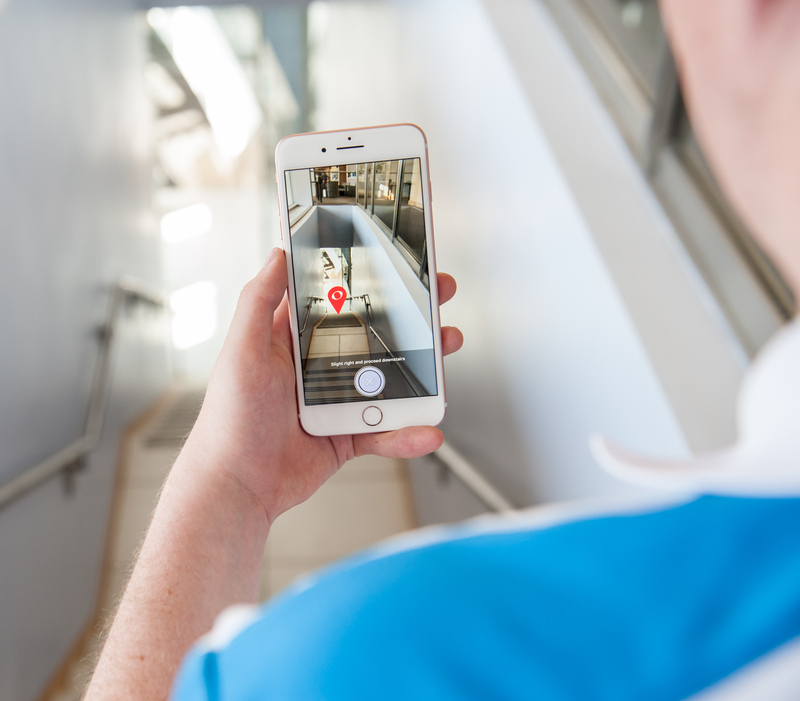 Clew is a path retracing app designed for blind and visually impaired users to help them independently return to any desired locations. Using Apple's new ARKit built for iOS 11 devices, Clew records a path and guides the user back to their starting location with a choice of voice directions, sound effects, and haptic feedback. Download the Clew app today. If you are interested in this project, I anticipate having several spots open for summer research. Please e-mail me if you are interested. 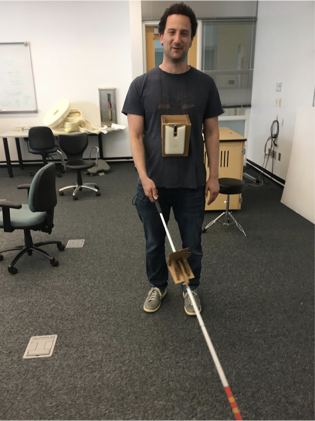 In collaboration with Eric Jerman, an Orientation and Mobility (O&M) trainer at Perkins School for the Blind, we are creating a suite of training apps that allow Perkins students to practice O&M skills in a way that is fun, motivating, and effective. The apps use the idea of "gamification of learning" whereby elements of game design are used to capture the learner's interest. In contrast to much of the work in the field, the goal is not to replace ubiquitous technologies, like the long cane, with high tech gizmos, but instead to use technology in service of better educational methods for tried and true techniques. The hardware / software platform we are using for this consists of a Google Tango phone, which is capable of high accuracy tracking of the phone's position in 3D, along with a harness and speaker so that a student can wear the device with minimal interference with their O&M training. The platform enables us to flexibly prototype and deploy a range of games. We take a participatory design process with this work, which includes getting expert design advice from Eric along with feedback directly from his students. 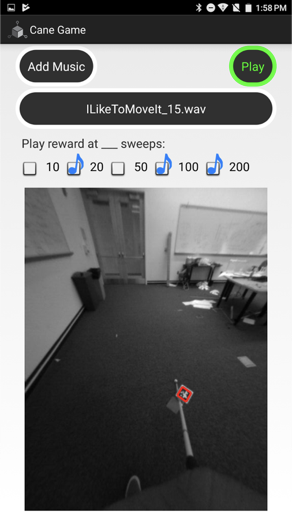 The pictures on the right show the hardware setup along with a screenshot from a game we designed called the "Cane Game", which provides students with motivating feedback as they perform proper cane sweeping behavior. Cane sweeping is a skill that is vital to safe travel for people who are blind, and it is a skill that is often tedious to practice. The system we have developed allows students to practice in a fun and customizable way. 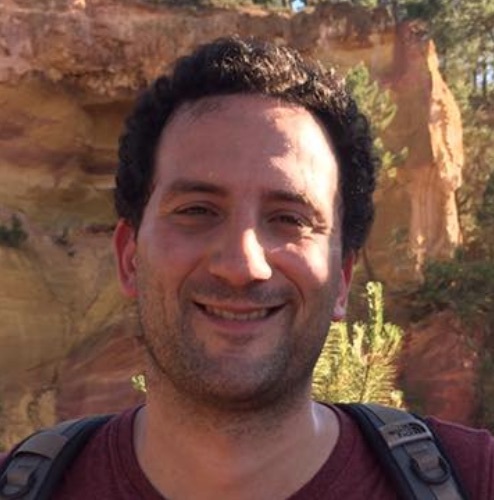 I'm primarily interested in how computer science can interface to other disciplines, both to bring computational thinking as a tool to broaden the space of approaches employed in those fields and also in service of teaching the practical skills needed for students to excel in those fields. Beyond teaching many courses that are consistent with this philosophy, I'm working on a number of research projects. Darakhshan Mir, Lori Pollack, and Sumita Mishra, and I ran an NSF-funded workshop on interdisciplinary computer science courses. I'm also collaborating with a group at Harvey Mudd College to explore new curricula to bring computing concepts and skills to non computer science majors.